When Marcello Gandini was offered a blank sheet of paper by Nuccio Bertone to draw the lines for a new gran turismo, both couldn’t have guessed that their first Maserati would turn out into an unintentional tribute to Giovanni Bertone. 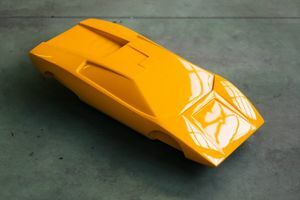 The Bertone founder died in May 1972 at the age of 88. 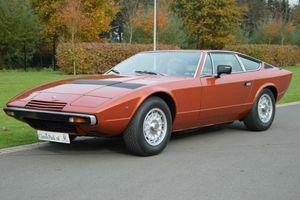 Later that year, the first Khamsin prototype was introduced at the Turin Auto Show. 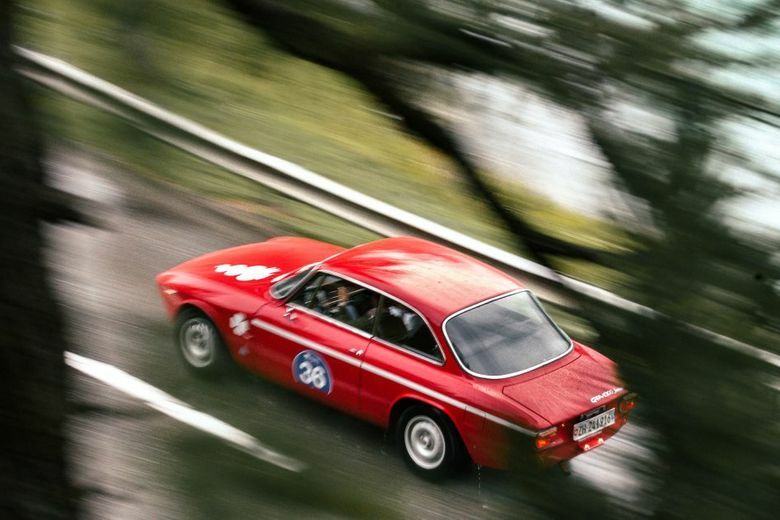 The first of 435 examples were delivered from 1974 and onwards, until 82. 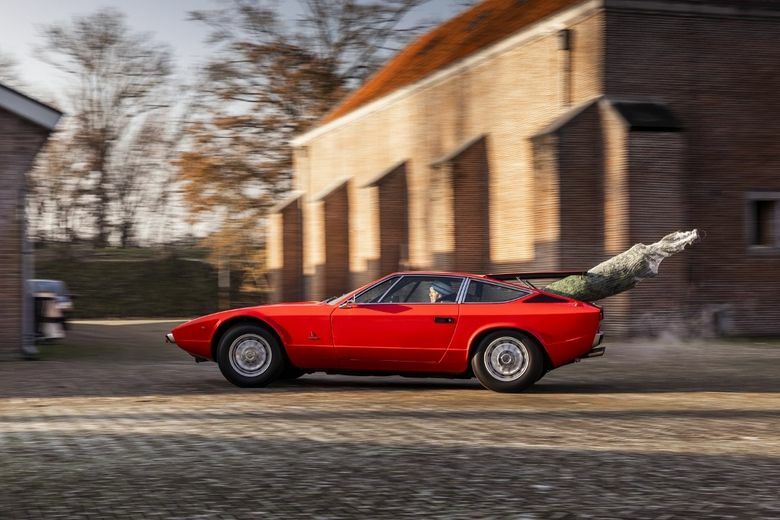 Today connoisseurs still look at the Maserati Khamsin like it is a work of art. The design aged well, but people who passed by during our test drive reportedly witnessed a UFO. Nothing has really changed since the introduction 45 years ago. 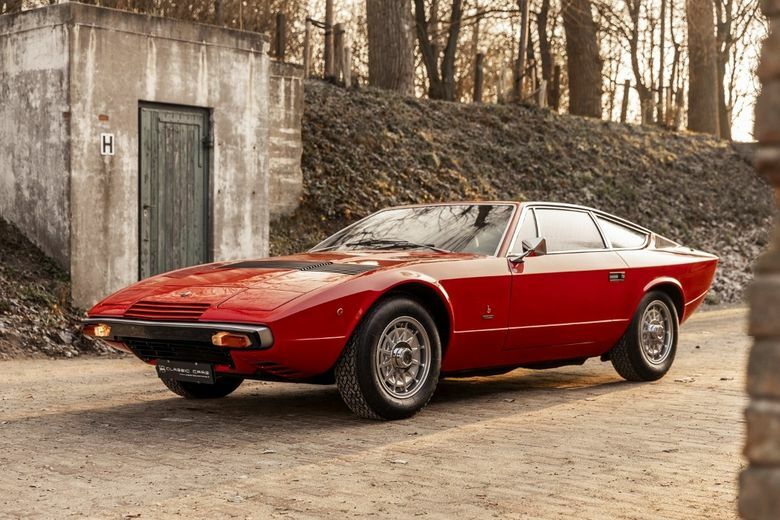 The old Bertone would have approved. 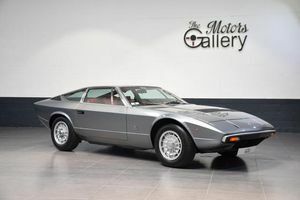 The very low mileage example we offer here was produced in November 1975 and delivered to the American Maserati importer in Los Angeles where it arrived in 1976. The first owner got it road-registered in 1977. The appealing Rosso Fuoco colour and original black Connolly leather offer a glimpse of what the Super 70’s were all about for the rich and famous. You can still spot the lines of its predecessor, the Ghibli, but the off-centre black louvres on the large hood and sharp angles set the Khamsin apart. Owners of these wedge shaped supercars with high performance engines apparently didn’t mind the the oil crisis as much as others. They went on with their lives at full speed, in style. Ironically, one of the owners of this Khamsin wrote books about the other kind of millionaires. The ones who grow wealthy because of modesty, thrift and prudence. His books are bestsellers. He just liked his sports cars. During the time the Khamsin was designed and developed Citroën took over the Italian company. Maserati engineer Giulio Alfieri took his chance and went shopping in Paris for parts. His brilliant ideas still reflect on the Khamsin today. The self-centering power steering, which was common on several Citroëns models like the DS and Maserati-Citroën SM, offers a very direct speed sensitive steering input with limited rotation of the wheel itself. Lock to lock is only a little more than 2 windings. You can drive with two hands on the wheel all the time, even while parking. This system was far ahead of its time and stayed unique until the introduction of active steering during this century. Braking feels also very common for Citroën drivers, but others will have to get used to it the first time. Otherwise the nose will dive onto the ground, because the braking pedal only requires a little but of pressure. 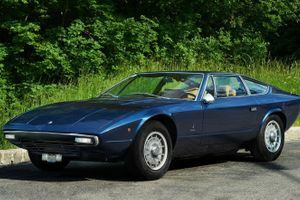 The Maserati Khamsin didn’t get the hydraulic suspension, for a more sporty ride, but Alfieri used hydraulics to operate the pop-up headlights and seat adjustment. Together with master designer Gandini the renowned engineer finished his last Maserati Masterpiece. The lockable fuel filler cap must be the finishing touch of their collaboration, because it’s integrated in the right rear quarter panel nicely and opens from the inside. Coupled to the powerful 4.9 litre V8 the Borg-Warner automatic gearbox makes driving this Khamsin a treat while seated perfectly behind the adjustable steering column. Everything is in full working order, even the power windows and air-conditioning. 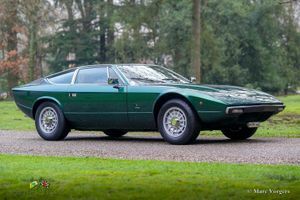 Driver and passenger can relax while cruising, but when driven hard the Italian ponies pull hard with exquisite tones only these massive Maserati V8’s can produce with their four dual Weber carburetors and double exhausts on each side. 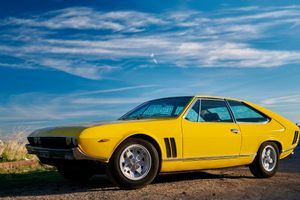 With nearly 320 horsepower and impressive flat torque curve the front engined Khamsin was among the most powerful European cars. It’s a different breed and definately Maserati’s finest V8 before the De Tomaso took over the company. 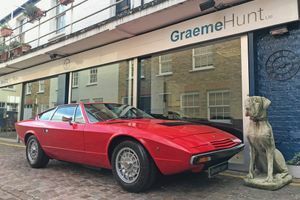 Just like other grand tourers the Maserati Khamsin handles very well while cornering, due to a perfect 50/50 weight balance and double wishbones all around. The luxury sports car stays neutral on the limit and this makes it a joy to drive. With the enormous space in the rear it’s easy imagine how great this car must be for travelling. Just pack tastefully, because all the luggage you put in the back is visible to bystanders due to the large rear window and transparent tail. On the other hand, the only thing they’ll remember is a real spaceship that gracefully passed by.